Their successful business might be hard to sell. They have to prepare the company 2-4 years in advance of their desired exit date. The company has to be worth the value to the buyer that the owner wants to sell it for. That last statement is the kicker. Let’s go through that one carefully. To be successful at selling a business, owners must stand in a buyer’s shoes. Stand in the shoes of a buyer. You have millions to spend (yahoo!!). You have big goals for this money: it has to give you a return on your investment. It has to buy you growth. Depending on what type of buyer you are, growth might be into new markets, new customers, new products, cool, smart, capable people, new territory, and/or more cash flow, higher margins, better distribution, growing bottom line, nice fit with current products, services or fills in the missing gap in solutions offered to customers. Look at the list below, and compare your strategic goals with the descriptions. Which company are you going to acquire? Doing some interesting things… but not making money. Doing the same things for a long time and making consistent, but not growing returns. Beating the competition in their own backyard, but not making money. Beating the competition and getting a good return. Expanding their reach in the market, adding cool gizmos and services but spending more than earning. Expanding and increasing gross margin. Doing more, beating the competition, expanding and growing their management team to take the business to the next level while growing margins. So which would you want to invest in? Now that you have picked your strategic target, you then find out that the owner is responsible for that growth and did all the design and sourcing on their latest cool gizmo. She’s ready to retire. Now let’s hop back into your shoes. There’s nothing wrong with you wanting to retire. There will be something wrong with the business from the buyer’s perspective, if you do not transfer your knowledge and skills to another gizmo wizard you’ve mentored from the ranks or hired and allowed to fly solo. Ah. There’s the rub. Can you trust someone to do what you have been brilliant at for years? There can’t possibly be anyone who has the same skill set. So you’re really irreplaceable. Or is being irreplaceable what you’re afraid of too? Don’t sweat it. Most owners see this issue as a big stumbling block too. But then they tried on new perspectives and eventually found solutions. Yes, with the right job description, great hiring system, your patience, mentoring and desire to make your business saleable, you too will finally get a pink slip… with a big cheque attached to it. So, are you ready to try on a new perspective? Here’s your checklist. You might want to do some thinking or talking with the right advisors to work through the catch 22s. 1. Mindset Adjustment: to make your business transferrable you need to have mentored the next level of management in all that you do. Trust becomes imperative. No one will do your job exactly like you will, they will use your advice, strategy and counsel to find their own way to success. They will need lots of runway time to become consciously competent and they will make mistakes along the way. That is how we all learn. Your new role as a mentor is essential to empower these people to grow your business so you can capitalize on the value you are all building together. The catch 22? What do you want to be right about: That you can’t find anyone to replace you or that you can sell your business? other subsequent decisions become hard to execute. For instance, if you really want your son or daughter to take over, but they really don’t have the skills or the inclination or the bank account (never gift your business, sell it to them and let them inherit the wealth you’ve captured) and you wait in hopes that this dynamic will change, you may lose your window of opportunity for any exit. 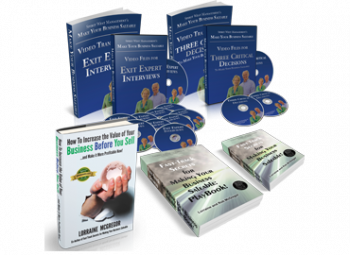 If you think you want to stay involved in the business but want to sell a portion of it, then the type of buyer that would be interested in that deal is very different than if you were leaving post exit. If you put off deciding to make your business saleable, and your ideal buyer is looking next year, you may not find a buyer when you are finally ready. If you can’t find a buyer, you may want to sell to employees who will need to report to a new general manager who wants to slowing buy in to the business. This process can take 5-7 years before you, the seller are paid out. You bet you want the business to have predictable growth and enough profit to pay you and keep growing. Catch 22 – Even though you think your exit is far away and these choices can be sorted out later these are actually critical decisions that will change everything about the way you see and lead your business from now on. The payoff? A saleable company is far more profitable for you… and aren’t you the current investor? 3. Build the Saleability Blueprint: To make the company worth what you want to sell it for to satisfy your financial goals requires making the right changes inside your business that will attract a buyer. That buyer is looking when it makes sense to their strategic agenda, not your exit date. So build your plan now and make the changes over the next few years and your interests are likely to coincide. The catch 22? If you hope to sell one day, but don’t make the company saleable and then find you have to sell because of ill-health, or changes in your industry and then can’t find a buyer, your financial nest egg will be far smaller than you had planned for. Think about living on 50% less of what you do now. 4. Implement your Saleability Blueprint: Depending on your ideal buyer type, and the changes that would need to be made inside your business to make it attractive to that type, you will also need at least two years of growing and predictable profitability (think margins, not revenues), a management team that is responsible for that growth, knowledge and goodwill embedded in systems, not memories, ‘go-to’ status in your market niche and be in an industry that still has legs. Catch 22? 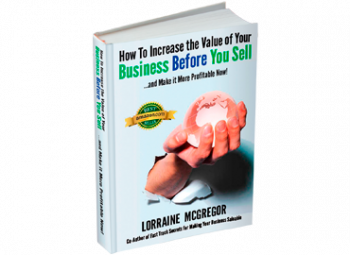 Making a business saleable is the same as growing it to the next level, finding and fixing profitability leaks and stabilizing it so it’s ready for growth. It’s exciting and bumpy. Ready for change? 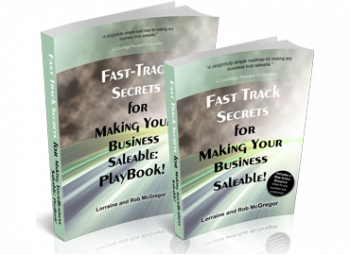 If you want to know how to build your Saleability Blueprint, you will want to get “Fast-Track Secrets for Making Your Business Saleable” book and playbook. The playbook asks you the questions that build the answers for your plan. If you want help determining how to get started and whether your company could be made saleable, we’re happy to talk via Skype or Phone. Just tell us how to reach you by going to this link.